Following the Pope’s call endorsed by Anglican Bishops for a day of prayer for DR Congo and South Sudan, the Primate and Archbishop of the Anglican Church of Burundi has appealed to Christians from the nine Dioceses of the Province of Burundi to join others Christians around the world in prayer. In a communiqué addressed to the Bishops of Burundi, the Most Rev Martin Blaise NYABOHO asked his fellow Bishops to organise a dedicated time of prayer on Sunday 25th February for brothers and sisters from the Democratic Republic of Congo and South Sudan who are passing through hard times of crisis. 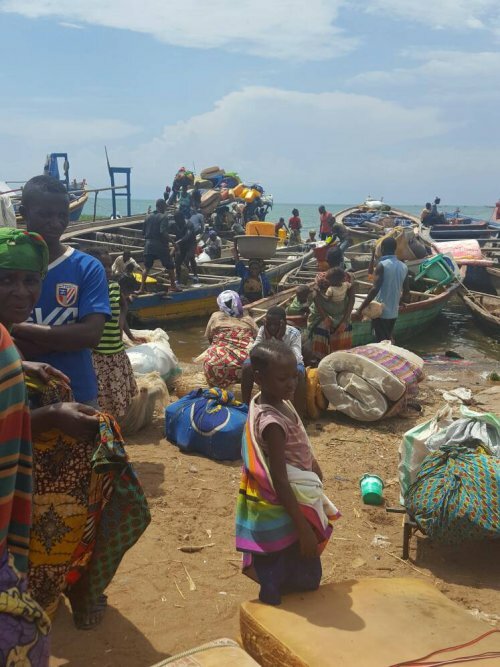 At the end of last month more than 7000 refugees from D R Congo had been registered in one week in Rumonge, a town in a southern province of Burundi alongside Lake Tanganyika. They fled when violence broke out between government forces and armed groups in the eastern part of DRC. “We are tired, hungry, but we thank God because we still alive. Many didn’t have that chance.” said a father with tears in his eyes after disembarking from a boat with his wife and five children after a long journey across Lake Tanganyika. Members of different religious confessions have joined NGOs such as Burundi Red Cross and IRC to mobilize food items to assist those people most of whom are children and women. The Government of Burundi in collaboration with HCR has transferred those refugees to transit centres in parts of the country far from the border with DR Congo. For many years Burundi has welcomed thousands of Congolese refugees. Some remain in the two main camps of Gasorwe in Muyinga and Bwagiriza in Ruyigi. Others have integrated into communities in different cities mainly in Bujumbura. Referring to Scripture Archbishop Nyaboho appealed to Christians, particularly those in the Dioceses of Makamba, Muyinga, Buye and Gitega where refugee centres have been set up, to keep showing compassion, love and hospitality to their brothers and sisters from DR Congo. He also stressed the need to be prepared to welcome fellow Burundians expected to return from camps in Tanzania.